Last month, Cristosal released its 2017 Report on Forced Displacement in El Salvador. (See the infographic here.) The report is an important way to highlight the plight of families fleeing violence in El Salvador, and it was featured in over 30 national media outlets in the country. Even Mauricio Ramírez Landaverde, Minister of Justice and Public Security, acknowledged violence—including violence caused by the police and military—as a significant factor driving displacement. I wanted to know more about the people behind the numbers. What does it really mean to be “internally displaced”? Where do the many thousands of people trying to escape violence in El Salvador go? What do their lives look like? To answer some of these questions, I tagged along with our Community Development staff to visit one family who is building a new life in the wake of forced displacement. The car ride out of San Salvador was long and bumpy. 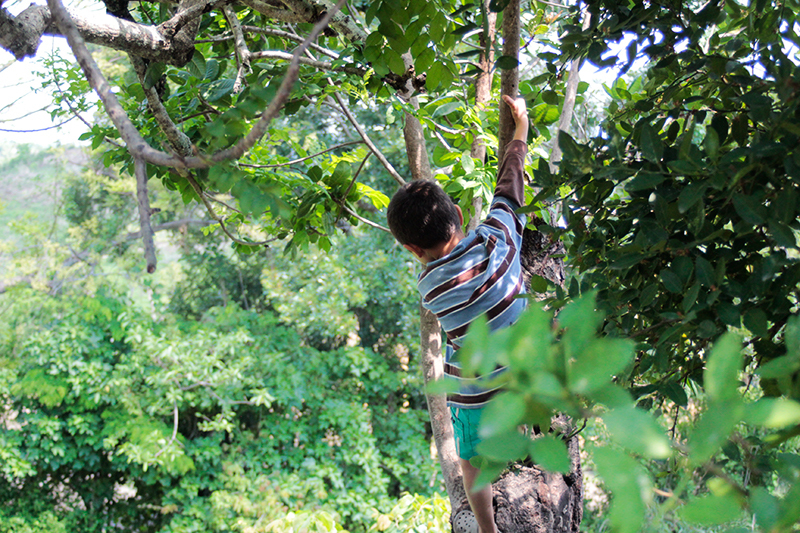 When our car came to a stop in the family’s community, a little boy in a blue shirt materialized out of nowhere. He excitedly drummed on the car doors until we got out. He already knew two of our companions well: representatives from Cristosal and the Quetzalcoatl Foundation who have been working with his family for over a year. He pulled them toward a nearby house made of cinderblocks with a corrugated iron roof. The little boy, Diego*, lives in this house with his father, Edgar*, and a mix of aunts, uncles, and cousins. They bought it from an uncle of Edgar’s half-sister three years ago. When we came around the corner, we found Edgar unstacking plastic lawn chairs in the shade beside the house. I took a seat, and Edgar and his sister Isela* started to tell me about their lives here. This wasn’t the first place Edgar and his family landed when they were forced to flee their home four years ago. After Edgar’s wife was murdered by gangs, the whole family moved to a town close to their original home. However, they were followed by rumors that the family was a gang target, and they had to move farther away—this time to Guatemala. A higher cost of living made it hard to survive in Guatemala, so they returned to El Salvador, to the property where they live now. Here, they find seasonal work in the fields; one brother can sometimes get jobs working security. About a year and a half ago, an acquaintance of the family referred them to the Quetzalcóatl Foundation. Quetzalcóatl is a nongovernmental organization committed to working with marginalized groups to build peace in El Salvador. They began attending to the family’s basic humanitarian and psychological needs in the wake of the trauma they had experienced. Quetzalcóatl asked Cristosal to partner with them to help the family build a long-term solution. Cristosal started working with the family to help them reclaim their proyecto de vida, or life plan. “They aren’t alone, they can trust in an organization that’s supporting them,” Eloísa told me. Cristosal staff helped the family make a plan for the future, based on their skills and interests. As a result of this planning process, the family decided they wanted to raise chickens and sell eggs in the neighborhood. Cristosal and Quetzalcóatl financed the construction of a chicken coop and purchased the first 50 chicks. Edgar is proud of the chicken coop—a well-built, well-maintained structure just down the hill from their house. Four of the family members are specially tasked with caring for the chickens, and their careful attention has paid off. “Not one has died, not one,” Edgar reports. My co-worker tells me this is rare: in a project like this, it’s expected that five to ten chicks won’t make it to adulthood. He credits Edgar and his brothers with keeping the chicken coop clean. “We make sure they always have food and water,” said Edgar. “Twice a day, I change their water to make sure it’s not dirty.” In June, the hens will start laying eggs. "DURABLE SOLUTIONS ARE NOT SIMPLE SOLUTIONS"
But there is hope. All of Edgar’s teenaged nieces and nephews were able to enroll in the local school. One nephew recently graduated from high school with a technical specialty in accounting. His skills will come in handy for managing the egg business, which shows promise. Above all, the family has stayed committed to one another despite unimaginable challenges—and they’re not alone. Cristosal and Quetzalcóatl still check in with the family regularly. Mauricio Quijano, Cristosal’s Community Development Director, knows that building a durable solution takes a long-term commitment. “This case is a work in progress,” he told me in an interview at the Cristosal office. In addition to accessing education, health care, food, and housing, a true durable solution includes things like participating in community organizations and being compensated for lost property. “The next step is to build trust with the community,” says Mauricio. In other words, finding ways to move past just saying good morning. By the time my conversation with Edgar and Isela came to a close, Diego had grown tired of the novelty of having visitors. He sidled up close to his father, then worked his way into his lap, teasing smiles out of all of us. After some coaxing from Edgar, Diego bid me farewell with a very grown-up handshake. As our car pulled away, I wondered what Diego’s future holds. This fall, he will start going to the local primary school. His family will continue working hard, selling eggs and working security and harvesting beans. Someday, I hope his government will fulfill its duty to families like Diego’s, and enact effective legislation and programming that will protect and assist victims of violence and forced displacement. Maybe then, Diego will be part of a new generation that can dare to dream of more than just survival. *All names have been changed for security purposes.